Define your exit strategy before you begin trading a stock. You should know your stock trading exit strategies before you buy a stock. This simple money management strategy can limit losses and save you from having a large loss if your trade goes against you. Lets look at the following example. 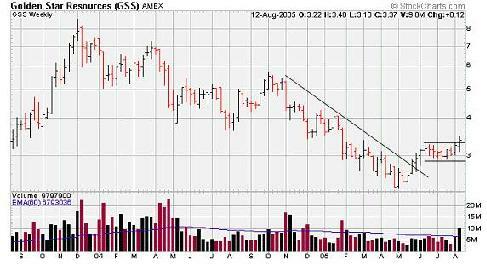 Looking at the 2-year, weekly chart of Golden Star Resources (GSS), on Friday August 12, 2005 on above average volume, it appears that GSS may be making a breakout. The long-term trendline was broken around mid May. The stock seems to have stabilized and is now appears to be ready to resume the up trend. 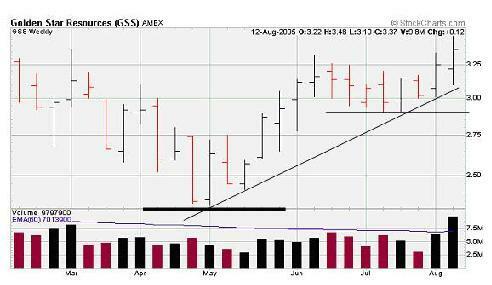 The second chart of GSS shown below is a six month chart. There are at least three areas where you may consider selling the stock if it goes against you. One is below the last low ($2.90), the second is below the trendline ($3.10) and the third is below the six month low ($2.33). Generally, the closer your stop loss sell point is to the market, the higher the probability that you will get stopped out. So when you set your sell stop, it should be at a place where strength has appeared in the past. The tighter your stop, the more shares you can buy without risking more. You need to decide where you will put your initial stop. But once it is set, only move it upwards as the stock moves up. Never move your sell stop downwards. After you know your exit strategy, you can determine how many shares to buy.